It’s 65 degrees in Chicago right now. It is SO unnatural, but SO enjoyable. This weather is tricking me into thinking spring is right around the corner, and it’s encouraging fantasies of picnics at the beach with light, crisp, and flavorful food. This tarragon chickpea salad is a perfect versatile food for spring. 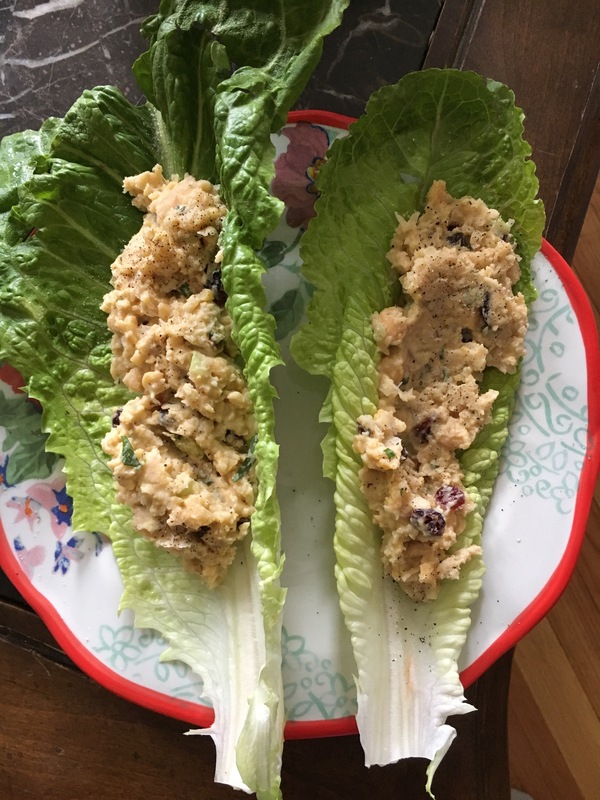 You can put it in lettuce cups, layer it with some bread, lettuce and tomato and make a delicious sandwich, or even top some crackers with it for a light snack, or flavorful appetizer. Drain the chickpeas, but keep the brine they come in. You can actually use it as an egg substitute in certain recipes! Put the chickpeas, mayo, garlic cloves, and a healthy amount of fresh tarragon into a food processor. Give it a few pulses. You don’t want to end up with a creamy consistency, just pulse it enough to mix everything together. Next add the cranberries, walnuts, celery, salt, pepper, and a squeeze of lemon juice. Give it a quick pulse to incorporate all the new ingredients and you’re set! All ready to eat! Now pack up a picnic with some white wine and pretend it’s not February and that winter is over.